Tralala; what a fantastic name for a perfume. It’s very hard to say it to yourself in anything other than a sing-songy voice. It’s what a young girl would trill while skipping through a meadow on a sunny day picking daisies and lacing them into her hair. Carefree and more than a little kooky, this unusual moniker combined with the clownish doll’s head bottle with oversized bow-tie, means that expectations for this fragrance are definitely set to “kitsch”. 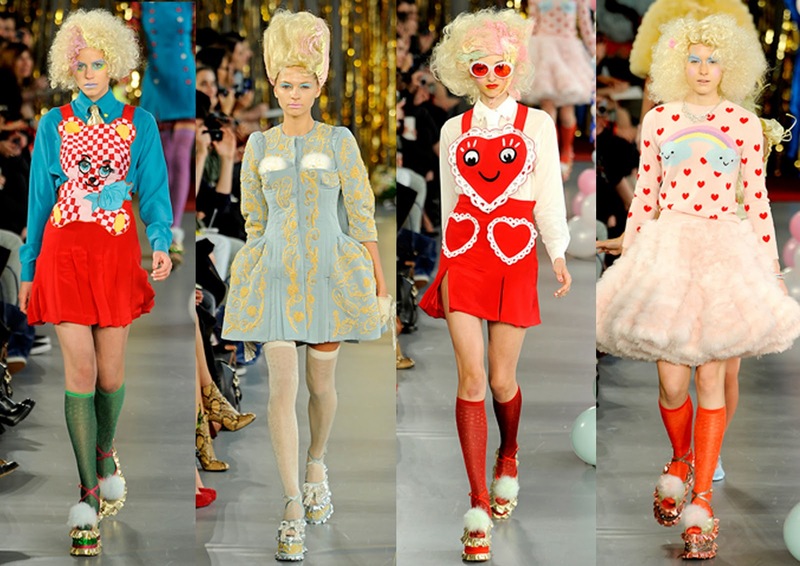 Tralala is the product of a collaboration between Penhaligon’s and off-beat British fashion house, Meadham Kirchhoff. The clothing label was established in London in 2007 and is known for mixing old-fashioned vignettes with modern aesthetics to come up with something frivolous and fresh. Their style is opulent, idiosyncratic and darkly romantic. Penhaligon’s have scented the Meadham Kirchhoff catwalk shows for the past nine seasons, so this joint perfume project seems like a natural progression. The fragrance is intended to represent “the surreal and fantastical world their designs represent”. Tralala has just been launched as a 100ml EDP and as with several other recent releases from Penhaligon’s (Vaara, Sartorial), the perfumer is Bertrand Dauchaufour. Base notes; patchouli, cedarwood, opoponax, vetiver, heliotrope, myrrh, musk and vanilla. This varied assortment looks like it’s been spewed out by a random note list generator. Again we begin to suspect the result will be suitably bizarre. The opening is definitely on message. It’s an oddball mix of clashing accords. There are lots of aldehydes, quite a bit of spicy saffron, a splash of whiskey and for a while, the cool metallic twang of violet leaf. The aldehydes are very soapy and airy, creating a retro haze over the more edgy top notes. Unlike the customary fizzy aldehydes which shoot up and then disappear like fireworks, this bright mist hovers above the skin for the best part of an hour. I suspect that with so much going on, different skin types (and noses) will pick up different facets. On me, the heart is chiefly a very supple suede underneath sweet florals with a few fronds of saffron left-over from the opening. The effect is soft, girly and lightly powdered. This stage is not dissimilar in feel to Bertrand Dauchaufour’s Traversée du Bosphore for L’Artisan Parfumeur. The warm base is resinous with vanilla, some fluffy heliotrope and a spiral of smoke from the opoponax, á la Shalimar. It’s a very conventional ending, but I guess even fashionistas like to pull on a pair of comfy jogging pants come the end of the day. Despite some weighty ingredients, Tralala tinkles away at a high register. It makes a style statement but never feels remotely loud or base heavy. It has very good longevity, lasting about eight hours on me. Although it’s not going to be everyone’s cup of (English Breakfast) tea, I wouldn’t call it challenging. That somewhat strange and soapy opening is the quirkiest it gets. Like that classic British foodstuff, Marmite, you’ll either find the perfume’s whimsical nature endearing or you won’t. Penhaligon’s describe Tralala as “counter culture couture” and that’s what it is for the most part: a refined and feminine mélange of differing elements in a fragrant game of mix and match. It juxtaposes vintage with modern, hot with cold and childishness with sophistication. It could prove to be this season’s must-have accessory for those fashion mavens who like to stand out from the crowd without pushing the boundaries too far. Have you tried Tralala yet? Are you tempted? This entry was posted in By Tara, Floral, Fragrance Reviews, Penhaligon's and tagged Fragrance, Meadham Kirchhoff, Penhaligons, Perfume, Review, Tralala. Bookmark the permalink. Ha ha, I love it too. That was my thought, exactly! I get a skin reaction after eating Marmite but I still have it, albeit less often. I’m addicted! I’m curious to try it but won’t go out of my way to do so: most likely, it won’t be love – they why to bother for the perfume that comes in 100 ml bottle (even if it’s cute)? Maybe it’s because my collection is relatively small but I don’t worry about bottle size as much as others, although I do completely understand. I’m more concerned about price per ml. I guess Penhaligon’s availability is not great in the Bay Area but it’s worth trying. I’m getting a lot of sueded safron today which is lovely. You capture the contrasting facets of this quirky new release brilliantly and very amusingly – love the ‘random note list generator’ and ‘comfy jogging pants’ – and I speak as someone who hasn’t tried this, but is very curious to do so now! That’s a lovely compliment, thanks V.
You should definitely check this one out. It’s quirky but wearable and the sillage is really nice. I had a sniff and was a bit confused by it, but my husband liked it. (May be the whiskey…?) I will try to get a sample for him and see how it works. Loved the random note generator. Sabine, the opening is a bit masculine with the whiskey but I find it quite girly after that, so good idea to get a sample. Tara, you make this quirky perfume sound quite appealing. I will try certainly try it if I come across it. I think you might like this Sandra, depending on how you find the beginning. If it throws you, do hang around for the rest because it’s lovely. I’ve never found a Penhaligon’s that I truly like, to be honest. Most of the recent releases have faded away to nothing on my skin extremely quickly. You didn’t get on with Sartorial? That was really well done and lasted well on me. I really want to try Juniper Sling next. I had a little dab of Malle’s Eau de Magnolia on the weekend and I loved it at first sniff. Nothing groundbreaking but gorgeous and top quality. I could imagine wearing it loads. Must get a sample on Saturday. Ha ha! Yes, but I had to give it back! I only really find them clashing in the first hour. It’s more of contrasting after that. Vaara is very rosy after that stunning opening. That’s too bad. Not sure if Eau de Magnolia is officially out yet – a friend in the business had a sample. I meant to comment the other day on your inspired review of Rozy,it was quite something-but anyway,Tralala,I am a bit disturbed by the controversy around this release,which had Meadham and Kirchhoff mentioning that the name was a reference to a character from the film /book “Last Exit to Brooklyn”,Tralala is a prostitute who gets gang-raped and murdered in what has been described to me as one of the most gruesome scenes in a film ever!Now Smell This had an article on it in January,Penhaligon’s has since tried to hush it up by withdrawing the article in which the reference was made,anyway I cannot face even trying this number-sorry to bring this up here,but it disturbed me a bit! Very happy to hear you enjoyed the Rozy review, that’s great. I really enjoyed writing about it. Matt: Why did you choose the name Tralala? Benjamin: We thought long and hard about a name, some were good but didn’t fit the context of a perfume. Edward came up with the name Tralala one day and it stuck – I like it because it is nonsensical. It doesn’t apply to anything specific. Edward: I woke up the morning after our show and I just knew that we should call it “Tralala” and could envisage exactly how it should look. I loved Tralala because it had no pretensions, no specific connotations, it just sounds sort of humorous and nonchalant but looks really good written. It has a nice rhythm to it. I don’t see why it wouldn’t work for you if you like soapiness and aren’t put off by any of the notes. Seeing as you like the bottle, that can also tip you over the edge. I’ll be interested on your take when you do get to try it. Oh dear! In that case, maybe not for you. Soapiness is usually a deal-breaker for me too. It’s done really well here though it has to be said. Definitely worth trying though for the experience and of course, that stand-out bottle. The opening is absolutely fantastic and quirky with aldehydes and whiskey.the dry down with orris is great too. However the final phase of dry down with base notes was utter disappointment. It was just vanilla and/tonka bean. Love the packaging except the funny face stuck on the lid. All in all not for me. Sadly I felt similar after trying Vara last year. The base notes for me is what makes the perfume should stand out for. The top notes will entertain and flee…the only fragrance I liked.somewhat from.penhaligons is sartorial. I do understand what you mean. A stunning/unusual opening can lead to disappointment if the rest of the fragrance doesn’t follow suit. Maybe quirkiness throughout the whole development might have been a bit much though. Actually one correction. The final dry down was lots of synthetic musk and vanilla. That was it. Couldn’t get anything else..where was myrrh hiding?? I didn’t spot the myrrh either but I’m surprised I missed the musk because it’s a material I often fail to register. I can smell some of them but no, I haven’t found my perfect musk perfume yet. I hope to read your take on it one day. B generously gifted me a 100ml bottle of Traversee du Bosphore which I am over the moon about. Love it. My partner is crazy about bosphore. It smells similar to mandolo from acqua di parma which he likes too. I’m crazy about Traversee du Bosphore too. I haven’t tried Mandolo as yet. I just orderd the perfume and cant wait to try it out. Have you ordered a full bottle or a sample? Either way, I hope you enjoy it.